Includes the names: N. E. Bode, Asher Bridget, Bridget Asher, Julianna Baggot, Baggott Julianna, V Julianna Baggott, Julianna Baggott M. F. A., Ms. Julianna Baggott M.F.A. Join Alexander and Bosco the third Sunday of each month at 2pm as they discuss Post Apocalyptic Fiction. This month's book will be Pure by Julianna Baggott. In Julianna Baggott’s breathtaking work Pure, Pressia barely remembers the Detonations or much about life during the Before. But she knows that the world went from amusement parks, movie theaters, fathers, and mothers to ash and dust, permanent burns, and fused, damaged bodies. And now, at an age when everyone is required to turn themselves over to the militia to either be trained as a soldier or, if they are too damaged and weak, to be used as live targets, Pressia can no longer pretend to be small. There are those who escaped the apocalypse unmarked. Pures. They are tucked safely inside the Dome that protects their healthy, superior bodies. Yet Partridge, whose father is one of the most influential men in the Dome, feels isolated and lonely. Different. So when a slipped phrase suggests his mother might still be alive somewhere outside, he risks his life to leave the Dome to find her. When Pressia meets Partridge, their worlds shatter all over again. Critically acclaimed, bestselling author Julianna Baggott also writes under the pen names Bridget Asher and N.E. Bode. She has published seventeen books over the last ten years and there are approximately 50 foreign editions of her novels to date. Film rights for Pure have been acquired by Fox 2000. The Giant Baby by Laurie Foos asks what you do when something magical happens… in your own backyard? Linda and Earl are a happy couple. Although married for many years, they have never had children. Still, they are content being together, and watching reruns of "I Love Lucy" keeps them close. That, and a magical garden that never seems to grow what they plant. One day Earl finds a set of infant toes in the loam. He and Linda plant them and watch in amazement as the garden produces an enormous baby. Now Earl and Linda have to figure out how to be parents — if they are parents — and what to do about the giant baby who eats everything and cries for his mama. Laurie Foos is the author of five novels published in seven countries. A recipient of fellowships from the Sewanee Writers Conference, Wesleyan University Writer’s Conference, and the MacDowell Colony, she currently teaches in Lesley University’s Low Residency MFA Program. Julianna Baggott's book My Husband's Sweethearts was available from LibraryThing Early Reviewers. 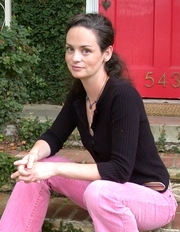 Julianna Baggott is currently considered a "single author." If one or more works are by a distinct, homonymous authors, go ahead and split the author. Julianna Baggott is composed of 9 names. You can examine and separate out names.